I love soup! chilled summer soups are lovely, but as soon as autumn rears its head, I’m thinking of what soups I can make. 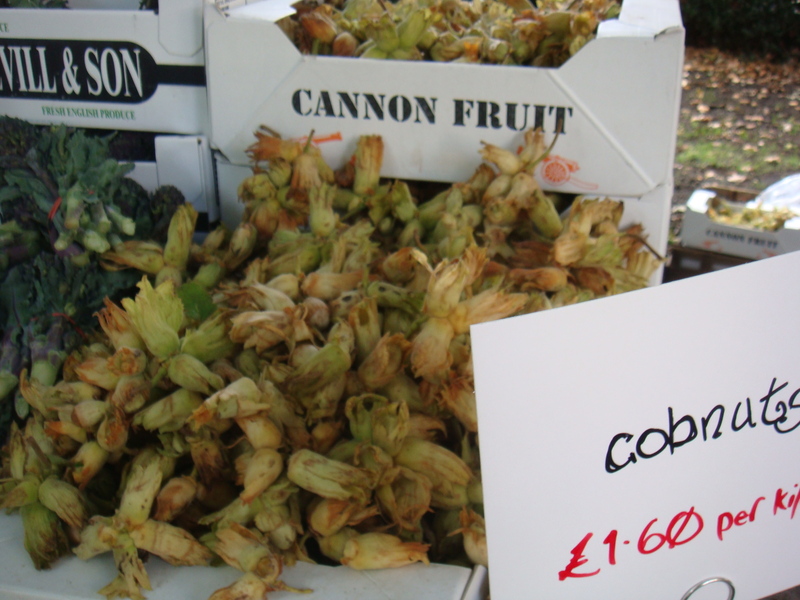 The day before I was about to head to Italy for a week, I landed a bag of beautiful looking cobnuts on the kitchen bench after being at the Farmer’s Market in Charterhouse Square. A few of the suppliers to Malmaison all teamed up for a special market. So they were shed of their lovely outer coats and stored in the fridge until I got back. On my holiday in Tuscany, I stayed at a farm house where the owners wife had planted many herbs. I found, what I thought was over grown parsley. It smelt very strong, a combination of anise, celery and a peppery flavour. The smell would not leave my hands. Aha this must be lovage! It was the first time our paths had crossed. After a bit of a tasting session, I though I would treat the cobnuts a bit like hazelnuts, to help me come up with something to do with them. Pumpkin soup is one of my childhood favourites. I think they will work well together. Heat a large saucepan over medium heat. Add oil and onion, soften. Add garlic, and saute for a further minute or two. Add pumpkin and potatoes, stock (just enough to cover vegetables). Stir and bring to boil, then simmer for about 20 minutes, or until pumpkin and potatoes are soft. Remove some of the liquid by dipping ladle or cup into saucepan. Blend the soup, either with a hand blender or in batches in the food processor. Finely chop the lovage and cobnuts, mix together. Serve hot soup with lovage and cobnuts on top. If you like a smoother soup, blend the lovage and cobnuts and a few tablepoons of mild olive oil or rapeseed oil, in a food processor, before adding to the soup. I think the lovage/cobnut combination would work with carrot soup and cauliflower as well. If your just after the pumpkin soup add a generous teaspoon of curry powder before the garlic and stir for a minute until aromatic.